A fascinating article run by Xinhua this week describes the so-called "add-on" (加号) system in which doctors squeeze in far more patients than are registered to see them. The official reason for this practice is that doctors often feel sympathy for ailing out-of-towner patient who cannot get a booking to see them that day. However, as the article reveals, the add-on patients are often more to do with doctors making informal arrangements seeing patients with guangxi (connections) or to see patients who have bought their booking slips from ticket scalpers. To understand the add-on phenomenon you first have to understand how China's medical appointment system works. To see a doctor in China you have to 'register' (gua hao, 挂号) at the front desk of the hospital before you can get to wait at the clinic And with demand for doctor appointments far outstripping supply, this means patients have to queue very early (often overnight) and for a long time to get one of the limited slots available to see a doctor in their chosen department. There are two kinds of bookings: general and specialists. Typically, a doctor in a hospital outpatient clinic will work a morning shift from 8am to 1pm. Assuming that he or she works five hours without a break and sees patients for an average of five minutes (far too brief for an adequate consultation), the doctor could be expected to see 12 patients an hour - or 60 patients per shift. However, some doctors are seeing 50% or even 100% more patients per day than their official limit. Why so? 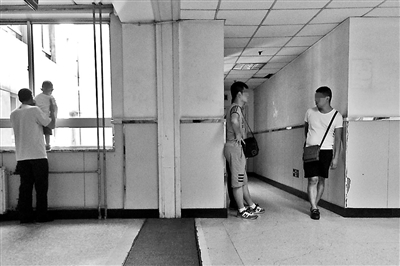 The Xinhua reporter describes the situation in the Chaoyang Hospital dermatology department, where he sees an impoverished family of 'waidiren' (out of towners) sitting with their ailing grandfather in the waiting room late in the afternoon. They are surrounded by their travel luggage and are telling the clerk that they have come from a remote town in a nearby province especially to see the doctor. At 6pm it is time for the doctors to finish their shift, but the doctor agrees to see the old man without a booking as a jia hao (add on). The patient is given a ticket with the doctor's signature and the clinic chop, and his family are able to take this to the registration desk to get an official registration slip to see the doctor. The doctor later explains to the reporter that because of his conscience he feels unable to turn away the desperate family who have been waiting there all day. However, he says he nevertheless feels guilty because his 'extended shift' also means that others have to stay behind - the nurses, clerks, pharmacists and security staff. The doctor says that all departments have 'add-on' patients, some more than others, and each clinic and each doctor has a different policy about how to deal with them. Some doctors and clinics refuse to have 'add-on' patients, even putting up signs saying they are banned, while others reluctantly agree to see some of the more pitiful cases - the elderly and the seriously ill. Some clinics even leave spare room for add-ons and the doctors try to 'triage' their add-on patients to sort out the most deserving and to weed out the tricksters, malingerers and the ones who have paid for their registration. The situation is complicated because not all 'add-on' patients are genuine. Some are simply putting on an act because they could not or would not wait in line to get a registration ticket. The doctor describes one woman who came to the waiting room with a wheeled suitcase, lamenting that she had got off the train from a distant town and needed to see the big city specialist. However, an eagle-eyed nurse noted that the woman's suitcase was very light and obviously empty. The other big problem with add-on patients is that they are exploited by the thriving trade in add-on appointments by scalpers known as 'hao fanzi' (号贩子). These are the 'black hand' middle men who hang around the hospital lobby pretending to be patients and getting registration tickets which they then sell on illicitly to patients who have missed out or don't want to line up early in the morning. To combat this, hospitals have introduced a system of ID checks, with registration tickets only valid for the person who has booked them. If the scalpers are unable to get registration tickets directly from the lobby office, they instead try to get bookings by posing as add-on patients. According to Xinhua, the going rate for a scalper-obtained place to see a doctor is 200 yuan for a general appointment and 300 yuan for a specialist booking. One doctor told the reporter that the fake scalper 'patients' were often convincing or persuasive and he felt too tired at the end of a long day to try work out if an add on patient was genuine or not. The scalpers also cause annoyance to Beijing residents. One local 70 year old man waiting in the rheumatology department told the Xinhua reporter that he had tried to get to see the doctor for three days but had not been able to get a ticket despite queuing for hours each day. He said he resented outsiders and scalpers taking up the appointments that should be prioritised for local patients. However another doctor hinted that about half the 'add-on' patients were not outsiders or scalpers but connections - guangxi. They would be patients with some connection to an important person, whom the doctor would 'fit in' to repay a favour, build up guangxi 'credit' or perhaps they were just friends or relations. There are also hints that many of the add-on patients use 'hongbao' bribes to be fitted in to see the doctor at the end of his or her clinic. But another doctor said that add-on patients were not a source of extra revenue - quite the opposite. He said doctors were paid a base salary and therefore if they saw more patients they did not increase their income. He added that it was not uncommon for a doctor to work a five hour shift from 8am to 1pm without a break. He joked that he dare not drink tea while at work as he never even had an opportunity to go to the bathroom because of the number of patients waiting to see him. For whatever the reason, the problem of add-on patients is obviously a major one - and yet another example of the problems that come from a health system centred on overloaded city hospitals.